Although altitudinal treelines are generally influenced by climatic conditions, geomorphological processes and human activities can locally limit the treeline position, conditioning its altitude and dynamics. In fact, in mountain regions, tree establishment and growth at the highest altitudes may be greatly affected by geomorphological processes and/or human impacts. 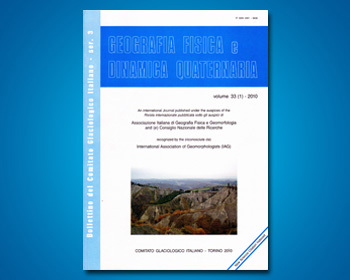 This study spatially and statistically examines the role of geomorphological processes and related landforms on the treeline position in Upper Valtellina (Central Italian Alps) through the observation of orthophotos and thematic maps by means of GIS software. Landforms located at the treeline boundary have been grouped according to their genetic origin into three classes: i) those shaped by running and/or channelized water, ii) those due to gravitational processes and iii) those due to snow and ice processes. For each tree belonging to the analysed treelines, the main active geomorphological process and the distance from the timberline (treeline ecotone width) have been associated. The gravitational processes are the most widespread along the treeline ecotone in Upper Valtellina. They represent the most significant geomorphological limiting factor for the treeline altitude, especially where deposits due to gravitational processes merge (e.g., merging talus cones and talus slope; treeline mean elevation: 2300 m a.s.l.). Gravitational processes, documented by the related active landforms, are also the most destructive of the treeline ecotone, reducing its width (mean width: 83 m) and inducing the overlap of treeline and timberline. In contrast, periglacial processes exert much less influence on the treeline position (mean elevation: 2419 m a.s.l. ).